If you were to take a peek inside our kitchen cupboards you’d notice that I like simplicity. I prefer a nice clean slate to showcase delicious food and pretty decorations on, so white plates and clear glasses make up about 80 percent of our housewares. Sometimes though, a pop of color can be a welcome addition. I was recently craving some color after I brought home some pretty yellow flowers. The clear vases I had on hand just weren’t helping them shine, so I decided to transform the rather plain items below into colorful bud vases. All you need to do the same are a few colorful balloons, scissors and some small vessels to cover. Seriously, it’s that easy. Take a look at the result below. Not bad, right? Whether they’re displayed on a shelf or lined up down the center of a table, I bet my guests would never guess that these bud vases are made from random kitchen items including jars, bottles, salt and pepper shakers, a shot glass and a jigger. To make some for yourself, use scissors to snip the ends off of a balloon (the amount you cut will vary based on what you’re covering). Stretch the latex over the vessel and adjust as necessary. The balloons will only stretch so far without tearing, so use your best judgement when selecting balloon sizes and objects to cover. I allowed the latex to bunch a bit on a few of the vases, which added a nice texture to the look. I also enjoyed when the balloon didn’t cover the entire object, and just provided a stripe of color (as it did in the glass bottle in the background of the photo). Play around and have some fun. SWWU Tip: The best part about this project is its versatility. Balloons come in every color of the rainbow, so you’re sure to find one that matches the look or theme you’re going for. Brian and I recently adopted two cats, Templeton and Gimlet. The now year-old-brothers have been a great addition to our home. When preparing for them to arrive, I was overwhelmed with the items they needed to be comfortable in our home. Not the volume of things, but the tackiness of them. Sure, I get that toys should be colorful and interesting so they can stimulate active kitties. But why does a food bowl need to be fish-shaped and say the word “meow” all over it? This just wouldn’t do. I started out looking for antique dishes. Surely kitties of the past were more distinguished, right? Unhappy with what was available, I broadened my search criteria. I knew that I wanted a bowl for each cat and a place for water—all matching. 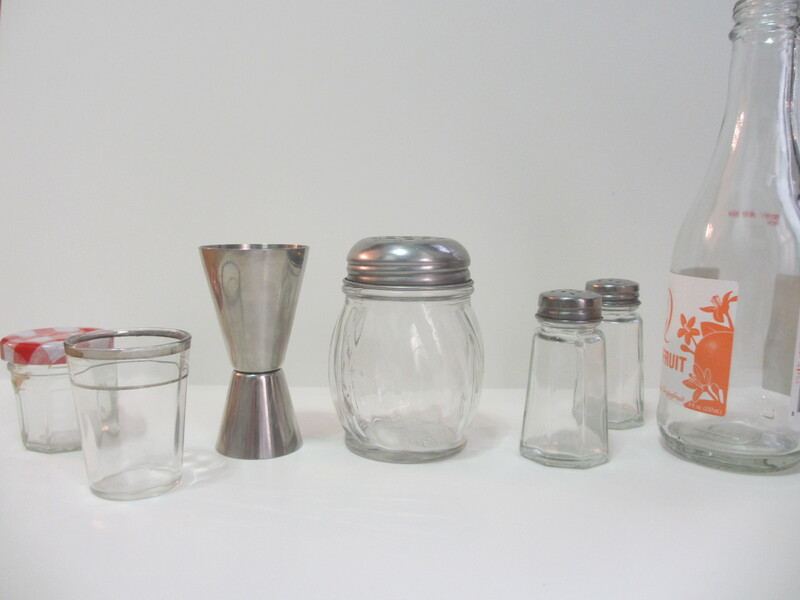 After typing “three dish dispenser” into eBay’s search bar I discovered a vintage condiment caddy. The intended use of this piece is to serve up relishes and other condiments on a buffet table, but I thought this could be the perfect solution for us. I started searching around online saw that some had four or five bowls, but most contained three in a simple yet attractive design. I liked that it would keep the bowls confined to one area, sort of like a feeding station for the felines. I finally settled on the one you see below. With shipping, this condiment caddy was less than $20. The cats seem to appreciate that their food is raised off the floor and each bowl holds just enough for our furry friends. The bowls can be individually removed for easy cleaning, too. I was worried about the whole tower tipping over, but it’s much sturdier than I expected and that hasn’t been an issue at all. The cats seem happy with our choice and I’m glad that we didn’t have to compromise our style. SWWU Tip: You can look for a vintage condiment caddy anywhere you might find antique goods: garage sales, salvage yards, antique stores and on websites like Etsy and eBay. Brian and I usually have a camera (or two) by our side whenever we go somewhere. We both tend to be drawn to nature and landscape shots the most and have amassed thousands over the past few years. Seriously, that is not an exaggeration. To help put some of our favorite pics on display, we created two gallery walls in our home. They take some planning and time to put together, but the results are well worth it. PROCURE FRAMES—LOTS OF THEM: For both of the walls, I was on a mission: Every brown (for the living room) and gold (for the bedroom) frame that was within budget was scooped up. I tried to get a variety of shapes and sizes and made sure that all had hooks for hanging. No hooks? No problem! You can attach sawtooth picture hangers to the back of nearly any frame if you have time. MAP OUT YOUR DESIGN: Lay out all of your frames on the floor and start planning your creation. It’s easiest to start in the middle and work your way out and it’s best to keep a similar amount of space between each frame. Remember that they can be placed vertically or horizontally and don’t keep too many going in the same direction all in one place. Mix it up! Walk away from your design for a bit, then come back and see how you feel. Snap a picture of the frames in one configuration, then try something new. You can always revert back to a previous design if you like it better since you’ll have a photo to refer back to. 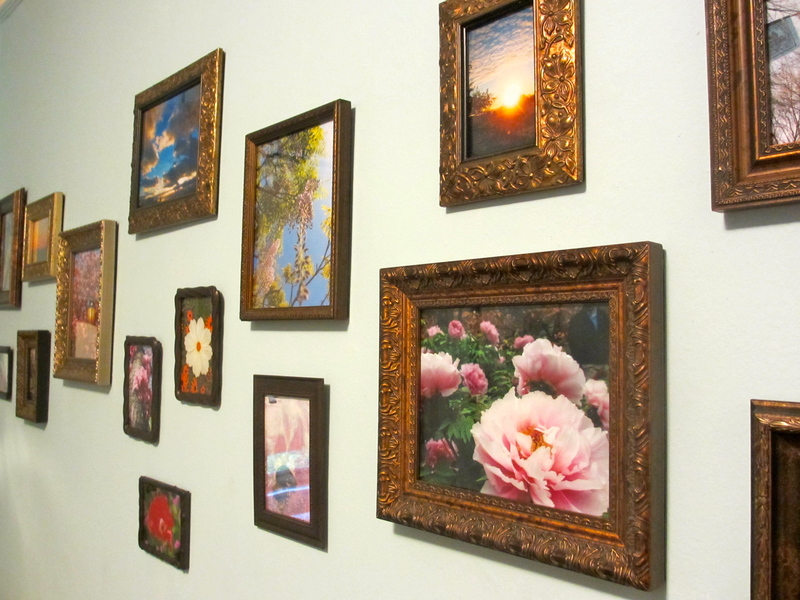 HANG THE FRAMES: Once you’re happy with your design, start attaching the frames to the wall. This step also works best if you start in the middle and work your way out, adjusting the placement of frames if you need to as you go along. Remember to step back after each one is hung so you can get a look at the big picture and make sure you are satisfied with the outcome. GO OVERBOARD WITH PHOTOS: Though a bit unconventional, I think it’s best to select your photos after the frames are on the wall. It can be hard to get the exact right configuration with the design and you don’t want to be locked into images that must be hung horizontally when the only thing that will look good in the space needs to go vertically. Besides, you’re likely to have lots of extra photos to choose from help get this job done. When ordering photos, get your favorites in multiple sizes (if you can afford to spend some extra money) so you can see how different options look in different sized frames. Once you have the photos, see which frame accents each one best and be sure to keep color in mind so you don’t have competing images next to each other. STRAIGHTEN UP: Sometimes it can be hard to tell if one picture is slightly off-center, but once you get multiple on the wall, these small imbalances will stick out like crazy. Once the photos are secured in their frames, attach a small pice of double stick tape to the back of the bottom edge of each one and gently push against the wall so it won’t move around. SWWU Tip: Add a pop or color or another point of interest to your design. We have a single window frame hanging in the middle of one of our gallery walls. Shelves, a single frame in a bold color, a mirror or a frame with a unique shape or texture would all add an interesting element to help draw the eye in. Do you have any secrets for getting a similar look on your own wall? If so, we’d love to hear about them in the comments below. Flowers are everywhere this time of year and I can’t help but pick up a bunch while at the farmers’ market or even after just passing by a colorful corner display. I have quite a few vases at home to help show off these beautiful blooms, but every once in a while I want to arrange the stems in a unique way. A few weeks ago I got a little crafty and made the display below. 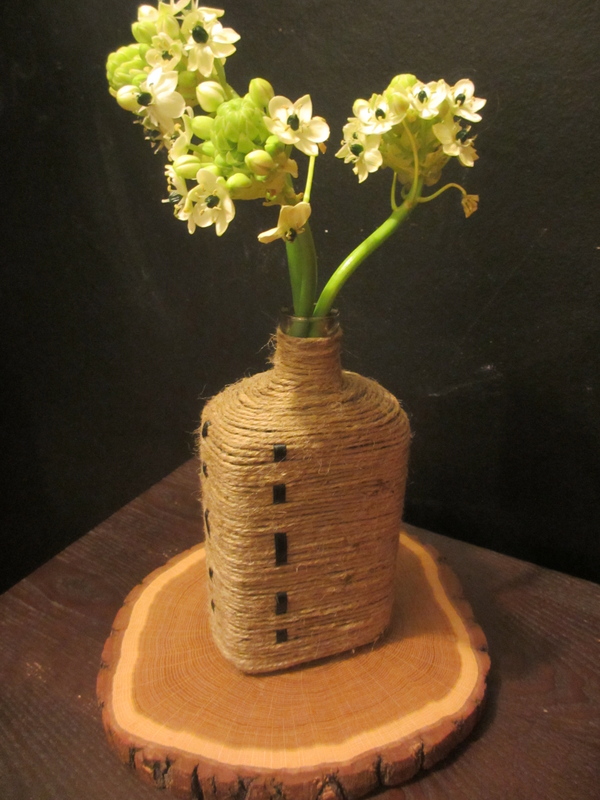 All I needed was an old bottle, some jute twine, ribbon and a bit of glue. Not bad for a simple afternoon project! 1. Wash and dry the bottle you wish to use. Measure and cut two pieces of ribbon that are each about 6 inches longer than the side of your vase. 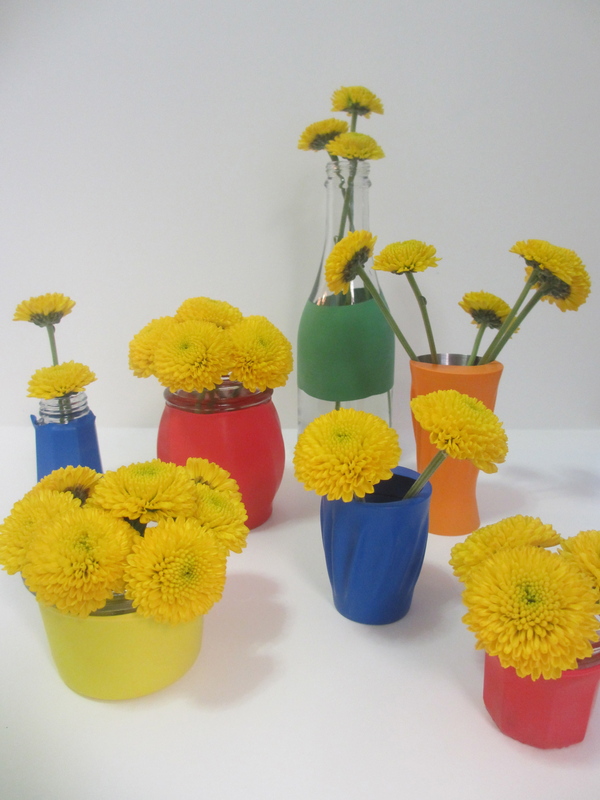 Use the glue to affix them to the bottom of the vase so they’ll be secure (see slideshow below). I chose to weave one ribbon up each side, with the front and rear ribbons being slightly off-center. You can place as many ribbons as you like, in whichever position you like. 2. Once your ribbon is secured, use the brush to coat the bottom inch of all sides of the bottle with a thin, even coat of glue. Starting at the very bottom of one side, begin to slowly wrap the jute twine around the bottle, covering the ribbon and making sure to keep each line very straight and very close to the previous line (see slideshow below). Once you have a few lines of twine wrapped, extend your ribbon out so it is away from the bottle, then add more glue and continue to wrap the twine. After adding a few lines, return the ribbon to the side of the vase, add more glue, and wrap the twine on top of it again. This will create a weave design. Continue up the entire bottle, weaving the ribbon in and out as you see fit. 3. Once you near the top of your bottle, trim the ribbons and glue the ends down so they stays secure (see slideshow below). Continue wrapping the twine up the entire bottle to cover the ribbon ends and finish off the look. Let dry for 24 hours before using as a vase. SWWU Tip 1: Don’t worry about buying a new bottle for this project. The vase above was created with an empty Knob Creek bottle. SWWU Tip 2: I rested my bottle on a pair of chopsticks placed 3 inches apart while working on this project. They helped keep the bottle elevated above the work surface so excess glue dripping down didn’t cause my project to get stuck to the table I was working on. I’ve amassed a lot of jewelry over the years, but despite my impressive collection, I always seem to wear the seem ten or so pieces over and over again. Not anymore! My new display keeps once-forgotten rings and necklaces right out in the open so they can get the attention they deserve. I found this antique letterpress tray at a local flea market. After a through cleaning by a good friend (thanks, BG) I had 196 cubbies to keep all of my jewelry neatly organized. I try to keep silver pieces in one side and gold on the other, but even if it all gets a bit jumbled, it’s easier than sorting through a traditional jewelry box. Though the tray would work just as well resting on a dresser, mine is secured onto an iron base I picked up at a salvage yard. I have no idea what its original intention was, but I’m quite happy with how we’re using it. SWWU Tip 1: You can find vintage letterpress trays all over the place: garage sales, salvage yards, antique stores and on websites like Etsy and eBay. 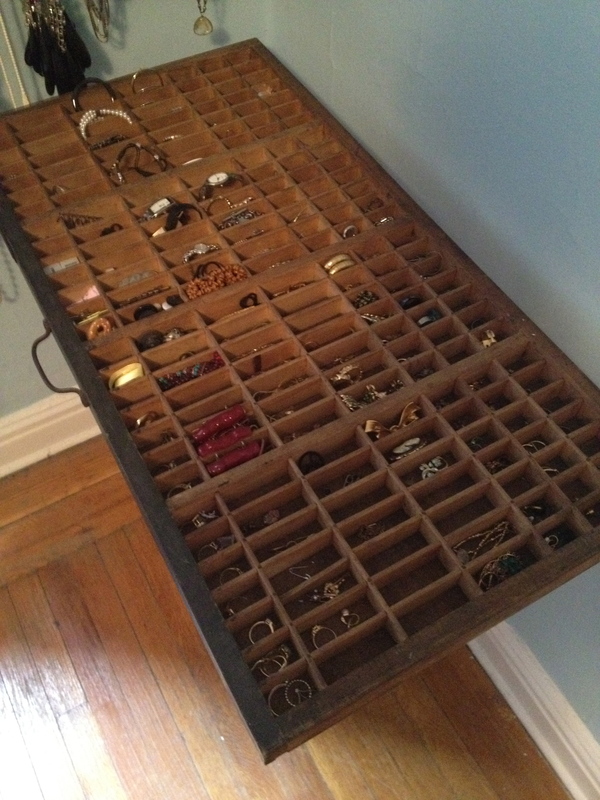 SWWU Tip 2: It’s best to keep only everyday jewelry organized out in the open like this. I still keep my special pieces locked up in a safe place.